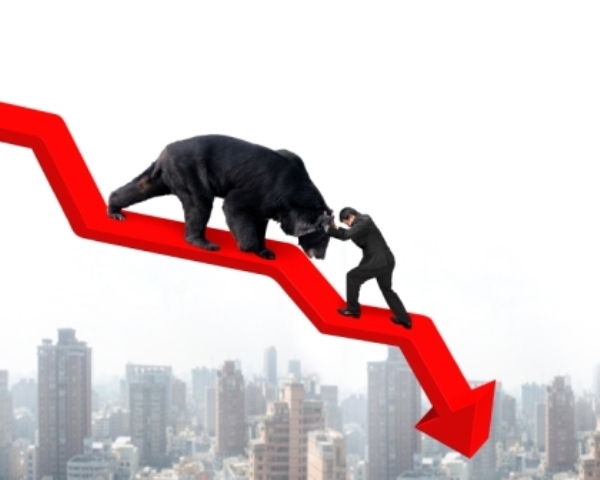 Home » Investing » Stock Market » What Should You Do When Bear Market Starts? A smart investor understands the different stages of the economy to guide his investment decisions. So what should you do when the bears come? It seems like the bear market close. Very close. History proves that the stock market and the economy move in continuous cycles repeatedly. A smart investor understands the different stages of the economy to guide his investment decisions. The stock market also has its own unique seasons that are popularly called the bull and the bear market. Both of them have their own set of overtones. A bull market is a situation in the financial market where prices of stocks are rising or are expected to rise. This is a period when investors show huge confidence. Strictly, a bull market happens when the rise is at least 20% as when Nasdaq climbed during the tech boom. Popularly, most investors have a much looser condition to consider it a bull market. A bear market is quite the opposite. It is a condition in which security prices fall and widespread pessimism fuels the market downward. Investors normally anticipate losses and most are forced to sell off. What Effect Has A Bear Market On My Investments? A bear market will cause a drop in prices of the securities you already have, sometimes to a sizeable degree. The decline may be extended over a period of time or it may be abrupt. However it decreases, the end result will be obvious – the stated value of your holdings will be lower. Falling stock prices and depressed markets work in favor of the long-term, value investor. In other words, if your intention were to hold your investments for years, it would be great to buy during a bear market. I am aghast at experts who advocate selling after the stocks have lost their value. The best time to sell in this situation was before the prices began going down. A true expert would have warned investors that the crash was about to happen before it actually did. Bear markets actually defy logic in a sense that it accelerates investor returns over the long run. A Wharton research supported this fact and the behavior of shares of some major oil companies. Fundamentally, if you have a diversified basket of equities, reinvesting your dividends speeds up your returns. It acts as a ‘total return accelerator’ and ‘bear protector’ – two descriptions coined by Wharton Professor Jeremy Siegel. Doing this drags down the cost basis of your portfolio as a whole. In order to reach the original cost of the investment, the quoted market value needs to increase gradually. Let’s look at the Great Depression as an example. If you take the stock prices as a whole, it might appear that it took 25 years to recover. However, for an investor who held his shares, reinvested his dividends and then sat tight, results came shortly. In such case, breakeven could have happened in a few short years. The last thing you want to do is panic. As in anything, panicking causes you to make ill-advised moves that could lead to catastrophic consequences. Financial markets have no pity to those who sell early or late. Take note that bear market losses are only ‘on paper’ unless you do actually sell. My advice is to use your head and not your heart. Do not sell out of fear. In fact, to survive a real grizzly bear attack, one is supposed to play dead and lie very still. Running away or fighting back can be very dangerous if not outright fatal. I and other seasoned investors have the benefit of seeing it all before. Do not panic and do not sell. Yes, you may continue to see your holdings lose their value but panicking will never give good returns. Keep your emotions in check at all times. Do not be jittery whenever stocks sell off. Fear is your worst enemy when the bear appears while greed is your most ferocious foe in a bull market. Think back why you invested in stocks in the first place. If you just wanted to make a quick buck, you have most probably chosen the wrong investment channel. If you are set on a five, ten or twenty-year term, you are okay. You know fully well that stocks go up over time and it would be senseless to rush it. You may also encounter a flash sale on the market. Remember that a flash sale is just a sale and there’s nothing complicated about it. If you were buying a year ago, all you need to ask is: what has fundamentally changed about the companies in your portfolio? If the only real change is that their prices are down, then there’s no real basis not to buy more of those stocks. Anyway, you paid more for these same stocks twelve months before. Review your overall financial situation before making any move in or out of the market. Make certain that your money and financial standing are as stable as possible. See to it that you have an emergency fund of anywhere from three to six months of monthly living expenses. Manage your debts and keep them reasonably low. Review everything that directly impacts your finances: your work, business, insurance, mortgages, etc. Go through a financial check-up with your financial adviser. I know people will give me flak because of this, but if you think you are a gold bug, wake up. If gold is your protection of choice, you better rethink your strategy. Yes, for a long time, gold has been a reliable hedge against equities. Unfortunately, it has been losing its status as the go-to sanctuary for investors when stocks start plummeting. Let me just clear this up. I’m not saying you should not allocate some of your portfolio to gold or gold extractors (See the best gold mining stocks for 2018)– you should, actually and we have already summarized the best ways to invest in gold. But if you’re depending on them as a hedge against securities, you might end up disappointed. If you really want to hedge, check out the next point. The best way to protect yourself against falling stock prices is by directly hedging your positions. I’m not talking about buying an ETF that tracks the inverse of the S&P 500. I’m saying use option contracts for their real purpose. Although they may sound intimidating at first, options are relatively simple. Options are also investment vehicles and investors should take advantage of them. They grant the right to buy or sell specific shares at a set price on or before a certain date. The good thing is, there is no obligation to buy or sell. The right to buy is called a call option while the right to sell is a put option. Obviously, you can hedge your position using any of the two options: buying puts or selling calls. When you buy a put contract, you purchase the right to sell a specified number of shares at a set price. For instance, you have 100 shares of MSFT purchased at $75 apiece. Purchasing a block of 100 put contracts at a $65 strike price will limit your losses for the duration of the contract. In this case, you can still sell your shares at $65 apiece even if the stock is trading for $50. You will effectively cap your losses to only 13% plus the cost of the contract, of course. If you sell a call contract, you sell someone the right to buy shares from you at a set price. Here, selling translates to the possibility of immediate income. Sticking with the scenario above, you can hedge your position by selling a call contract. You can sell a block of 100 shares at a $90/share strike price. This way, you cap your gains to 20% but in a bear market, this will be worthless and expire. However, when your stocks fall in price, you can still get paid. When falling markets become overwhelming, it’s time to give your Financial Advisor a call. Your Advisor can put things into a reasonable perspective. I will say that most of these experts have “been there, done that” many times before. Since during these times you can be emotional, I will advise you to talk to more than one expert, and even considering to use Robo advisors that neutralize any human feelings (but not sure they would be able to deal with extreme cases). They will expectedly have a better understanding of how to deal with bears than the amateurs. Checking your trading account and watching stock charts on an hourly basis is a bad habit. Although it is good practice to keep abreast of the developments in the companies that you own, be reasonable. Frantically checking your balance moment-by-moment will likely confuse you more. We all want to log in and see our bottom lines rise every day but in reality, it takes time. Panic watching does nothing to influence your holdings and does everything to play with your emotions. In a bear market, it is torture to obsess about your balance. It’s the kind of behavior that magnifies the situation and leads to wrong decisions. When you keep seeing red, it could be enough for you to just sell even when you shouldn’t. At times, the best thing to do is a pause. Take a breath of outside fresh air. Enjoy your day. Smell the flowers. Believe that the storm will pass (it always does) and then the sun will shine again. When the bear is approaching and behind it are the dark economic clouds, look at your cash assets. Keep them in safe, interest-bearing instruments such as bank investments, US Treasury Bills and money market funds. Do this to safeguard your money and also earn a good return. When stocks are falling by 10, 20 percent or more, you’re more likely to come out ahead with these vehicles. Many ‘would be’ investors take the words of Warren Buffet, Howard Marks and the like, out of context. They think that investing in a bear market is as simple as aggressively buying cheap stocks. Going long in everything and anything that screens low is not the way to do it. To believe that a bear market makes investments cheap is to believe in a myth. What a bear market actually does is to make investments mispriced. In many instances, a bear market causes some good stocks to go really down. In fact, some of the best opportunities arise from stocks that the market has unwittingly viewed negatively. However, it is hard to identify these opportunities for the reason that it also goes the other way. There are also many mispriced stocks whose prices have gone up due to market (mis) perception. Nevertheless, the market is generally intelligent. For the vast majority of stocks that fell 90%, there is indeed a valid reason why they fell. A lot of these stocks are in reality, worth nothing. As an investor, your job is pretty straightforward: to distinguish between mispriced stocks. I somehow like a bear market. It is not because it gives me the opportunity for a shotgun approach to buying everything that looks cheap. Most of the time, this approach will have a disastrous ending. A stock that fell 90% still has the probability of falling yet another 90%, and so on. I like it because irrationality abounds in a bear market and the entire market becomes inefficient. In a normal condition, I consider myself lucky if I find 1 or 2 compelling options in a year. In a bear market, these distortions become more bountiful.